This month’s collab is Singin’ In The Rain. It’s packed full of fun spring items and the bundle includes all the cute theme elements too. Whether the weather is sunshine and rainbows or rain storms and clouds this collab has you covered! Pick it up the first few days of the month while it’s on sale! 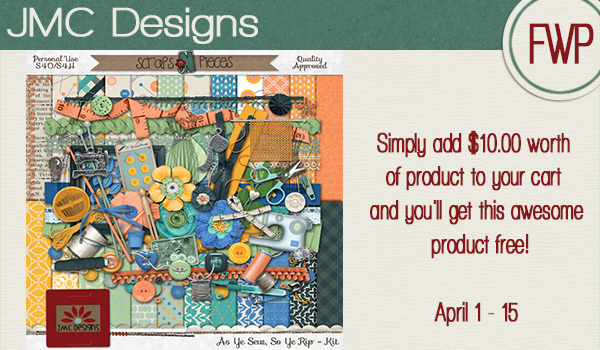 Here is your look at the all new Bits N Pieces packs for April! Each piece is just $1 so mix and match to your hearts content! Lots of different themes to pick from again this month. Our new free with purchase item is brought to you by JMC Designs. She has put together a great kit, As Ye Sew, So Ye Rip. Spend $10 in the store and you can snag this kit free! Finally, we have our schedule for the April Speed Scraps to share with you! Make sure to mark these down and join us for a fun filled hour of chit chat along with instructions to create a great layout. Submit by the deadline to receive a prize from the host designer! Happy February everyone. We’re stocked full of brand new goodies at SNP and ready to start this lovely month. Our new designer collab, Mary Poppins, is full of great items to help you scrap just about any page. You can get it as a kit or grab the full bundle to snag some great themed elements and word bits. Bits N Pieces is all new this month with lots of packs to choose from. Each pack is just $1 the first week. Don’t forget, when you complete a layout with these packs, you can post in the forum under the BNP challenge to earn points towards a coupon! Kayozz Designs has a new template pack for you this month, Template Pack 5. Spend $10 throughout the SNP store and you can get this free! This month’s daily download is brought to you by Rocking B Designs. You can pick up all the add ons for this kit by stopping by the blog everyday this month. The coordinating kit is also 50% off. Don’t forget to add the Speed Scrap dates to your calendar and come join us. You’ll receive a set of instructions to create a layout over the course of an hour, then complete and submit it by the deadline to receive a great prize from the host designer. Music speaks to many of us in a universal language we call can understand. Its timeless qualities bring enjoyment to generation after generation. The latest Scraps N Pieces store collab, The Sound of Music, brings this timeless quality to your scrapbook pages. This vintage-inspired collaboration draws on a rich history and subdued color palette to complement modern and heirloom photos alike. Gentle creams, browns, peaches, and a pale blue snuggle cozily with faded black and metal tones to form the perfect harmony. Featured elements include musical notes and instruments galore, ephemera, sheet music, flowers and lace, and a gold wire alpha. Complementary patterned papers and two delicate templates echo this timeless feel. The Sound of Music also comes with an element pack perfectly themed to the musical of the same name. Whether you’re singing about your favorite things or enjoying the sounds of a symphony, scrap your stories with The Sound of Music. You can buy the add-on element pack separately or in a bundle with the kit. I love the musical theme to this collab and I knew the first layout I would create would have to use some of those fun music themed ellies. I scrapped my daughter’s first piano recital with them. I really loved the bicycle and ellies that give a nod to the iconic musical. At first, I wasn’t sure what I would scrap next, but then I remembered this photo of Sister Bernadette, my great-grandfather’s younger sister. I made a freebie for you. You can click here or the image to download. January is here, and as we usher in the new year, we’re also gearing up for another great year at SNP! In addition to the new store items today, there are also a couple new challenges in the forums for you to check out as well. So don’t forget to swing through there after you finish here. The new designer collab this month is The Sound of Music. This beautiful collab kit can be picked up on sale the first few days of the month. We have a bit of variety with this month’s Bits N Pieces so there is a bit of everything from cowboys to winter, excersize, and change. Pick up each piece for just $1 until the 7th. Did you know that spending $10 in the store at SNP gets you a free item? The first half of January, you can pick up this great winter kit from Triple J Designs. JMC Designs has some great add on items to her new kit Winter Adventure. You can pick up all of those pieces, for free, just by stopping by the blog everyday this month! Before you go, don’t forget to mark down the following Speed Scrap Dates. You’ll receive instructions over the course of an hour from the host designer. Put together a layout with those instructions and submit by the deadline and you’ll get a gift from the host as well! December has blown in and with it we have many new goodies to share with you. Santa Claus is coming to SNP in the new designer collab kit Santa Claus is Coming to Town. You can get the kit, cards, or bundle of both. It will be on sale for the first few days of the month only. Bits N Pieces is all new this month again with pieces inspired by home, winter, and Christmas. Each pack is $1 through the 7th of December. 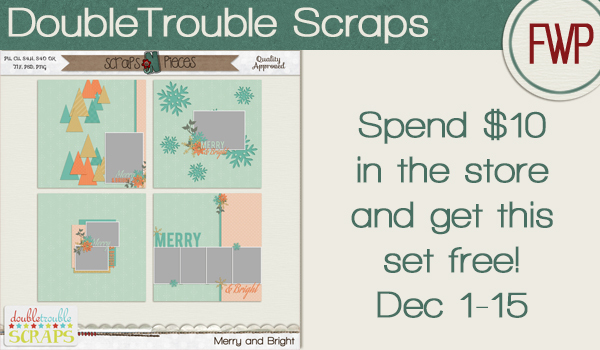 DoubleTrouble Scraps has put together a fun template pack as the Free Gift wit Purchase the first half of December. Spend $10 in the store and you can get this template pack free! We’re having a Countdown to Christmas for our daily downloads this month. Stop by each day from December 1st through the 25th and grab the goodies our designers have put together for you. Finally, you’ll want to set aside some time to join in on our Speed Scraps this month. Meet up in the forum or chat room for an hour of instruction. Complete the layout in the designated time and you’ll receive a participation prize from the designer hosting.